Engineering design consultancy, Eadon Consulting, continues to grow by finding the right talent and developing them through internships. The company works across a number of sectors, with expertise in mechanical, control, hydraulic and structural design and has has moved office four times in six years within the AMP Technology Centre on the Advanced Manufacturing Park (AMP) in Rotherham due to the growing nature of the business. Operating within a very specialist field, recruitment has always been a challenge and graduate internships has been the solution for the business that needs talented, skilled people with an enthusiasm and thirst for more in-depth industry knowledge. Now with 15 staff, Eadon has worked with the RISE project since it launched in 2012, taking four graduates and employing three on a permanent basis. 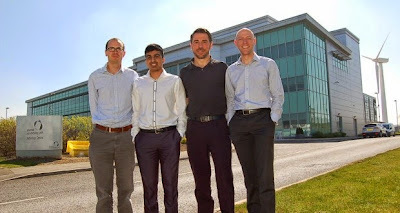 RISE is an initiative between Sheffield City Council, Sheffield Hallam University and University of Sheffield that connects businesses with graduates. It was set up in response to SME feedback around recruiting graduates, which highlighted issues such as not having a training framework for a graduate employee and assessment centre style recruitment processes to find the "right" candidate being too expensive. Graduates also had concerns around employment opportunities. James Hill, director at Eadon Consulting (pictured, right), said: "In the past it was common for engineers to undergo some form of apprenticeship as part of their formal training. In today's world most engineers leave university having really enjoyed the academic side; in which case they often follow an employment path that allows them to specialise in calculations. Or, having developed a love of the creative aspects, they follow a design route into the workplace. We wanted an internship because this would allow us to marry these two skill sets with the more traditional in-house training of manufacturing methods and "drafting", something which we just wouldn't be able to achieve in the same way by employing a graduate without a period of mentorship. "I honestly believe that we need schemes like RISE to secure our future. Engineering is a rapidly evolving industry but we must not lose the skill set and knowledge of our most experienced practitioners. Internships, much like apprenticeships, enable us to train the next generation of engineers so that knowledge is advanced rather than exchanged. It bridges the gap between academia and working practice." RISE has gone from strength to strength, recruiting a further four rounds of graduates into SMEs and announcing its seventh intake to commence in June - RISE 7. In addition to managing the recruitment and placement process, RISE provides six months on-going support and a wage subsidy of £1,000 for employers to use with their first newly appointed graduate. It is open to businesses with less than 250 employees and their own premises in Sheffield city region. Other Rotherham firms benefiting from the RISE scheme include HBM nCode, Massarella Catering and Moorhead Savage.